Because so many older adults visit an ED due to falls, many experts see an opportunity for EDs to play a role in reducing future falls among older adults who are at high risk. In a new study, published in the Journal of the American Geriatrics Society, researchers explored whether older adults who received physical therapy (PT) services while in the ED for a fall experienced fewer fall-related repeat visits to the ED. The research team used Medicare claims data representing Medicare beneciaries from across the country. The information examined differences in 30-day and 60-day ED repeat visit rates among older adults who visited the ED for a fall and who received PT services in the ED. The researchers compared that to older adults who did not receive PT services in the ED after a fall. PT services in the ED can include getting information, a diagnosis, and a referral for follow-up PT care after discharge. The researchers reviewed records for people aged 65 and over who had visited the ED for a fall, excluding people who died during the 30-day and 60-day follow up period. 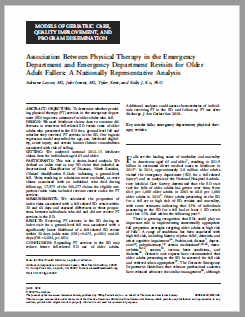 Receiving PT services in the ED during an initial visit for a fall was linked to a lower chance of returning to the ED for another fall within 30 and 60 days. Geriatric care experts have previously recommended that older adults who visit the ED should be screened for high fall risk and referred, when appropriate, to physical therapists or other members of the healthcare team. In fact, previous studies have shown that when older adults follow special PT or exercise routines after a fall, they can reduce the risk of future falls. In spite of these findings, PT assessments and referral services remain rare in the ED. Older adults who go to the ED for a fall rarely receive the kind of examination and referral for PT services they need, said the researchers. The researchers also said that their results suggest that EDs could play an important role in lowering fall-related ED revisits. That role is primarily to connect people treated for a fall to appropriate follow-up care. PLEASE READ THE FULL ARTICLE IN EUREKALERT!